Astles offers a unique opportunity to acquire a simply outstanding residence in this highly regarded North Essex village occupying a prominent location only a short stroll from the village amenities. The property has attractive Georgian elevations and has been the subject of a meticulous restoration programme under the scrutiny of the current owners who have used only the finest materials throughout to create a truly stunning family home which boasts both period splendour and modern convenience. The property is entered via a panelled and glazed door which gives way to the reception hall. This area of the house has fine period detailing throughout with Georgian arches, detailed balustrading, mahogany hand rails and mellow oak flooring. The split level feature gives way to the rear hall which has French doors leading to a York stone terrace with the south facing grounds beyond. The drawing room is situated to the rear elevation of the property and is a delightful room with twin full height shuttered sash windows giving views to the grounds and an especially ornate pargetted ceiling with detailed fret work. The room is further complimented by a red brick fire place with Oak lintel and inset wood burning stove. The family room is accessed via the rear hall and has full height shuttered sash windows with views to the grounds and an attractive red brick fire place with wood burning stove. Furthermore there is a complete range of bespoke bookcases and cupboards which add to its versatility. The dining room is situated to the front elevation of the property with views over to greensward and Pye Corner, it is a particularly cosy room with an elegant range of panelled fronted cupboards and also has a detailed marble fire surround and attractive Georgian panelled door to a large storage cupboard. The study is situated to the front elevation of the property and has a pretty red brick fire place with lintel over and brick hearth and a detailed Georgian arch entrance. The inner hall links the main reception hall and reception rooms to the working end of the house with comprises a stunning AGA kitchen/breakfast room with an entire range of bespoke kitchen units hand made by 'Keith Grey' to include a walk-in larder fridge and a four oven AGA which is set in an attractive tiled recess with a large mantle above. There is a Butler sink flanked by granite work surfaces on a bespoke free standing unit with draws under and the room is completed by attractive black and white tiling. A square arch then leads to a preparation kitchen fitted with a range of bespoke hand-made units with a large dairy style sink flanked by granite work tops and drainers. There is also an integral freezer, dish washer and micro wave which are set in a hardwood panel fronted cupboard and the black and white tiling continues into this area. A panelled door leads into an inner lobby which is accessed via mellow red brick steps which gives way to a period style cloakroom beyond which is a plant/utility room with has a range of hand-made units with granite surfaces, Butler sinks and stone flooring. This room also has a glazed door to the rear entertaining terrace. The ground floor accommodation is completed by a further cloak room which is accessed from the reception hall which is also fitted in a style to match the period of the property. There is a cellar accessed from the reception hall which provides extensive wine storage. The first floor is equally striking with a delightful galleried landing which has two Georgian arches accessing the bedrooms and views to Pye Corner. The principal suite is situated to the rear of the property and benefits from stunning views over the grounds with the Parish Church in the distance. It is an especially elegant room with detailed cornicing and an attractive carved wooden fire surround with cast iron grate. Steps lead to a lavishly appointed en-suite bath/shower room which has a free standing roll top bath, an elegant sink and large walk-in shower cubicle. The guest suite is situated to the front of the property and is of generous proportions with an attractive cast iron fire with carved wooden surround adjacent to which is a large storage cupboard and there is a door to a well-appointed en-suite shower room. There are three further bedrooms on this floor two of which have detailed fire places with attractive tiling with one of the rooms taking in delightful views of the garden through a large sash window. There is an adjoining play room/study which is fitted with a range of bespoke desks and shelves and beyond here is a charming family bathroom with a free standing roll top bath and a large walk-in shower cubicle. The second floor provides useful au pair or nanny space if required with a delightful double bedroom with takes in views of Nunnery Street adjacent to which is a large sitting room or further bedroom if required. Beyond here are two further attic storage rooms. The property is approached via attractive wrought iron railings with ornate posts supporting a gate which leads to a tiled path to the front door. The grounds to this property are an absolute delight and benefit from a predominantly south and west facing nature and are distinctly segregated into various areas of formal garden, vegetable garden and wild gardens. There is a fine array of out buildings and ample parking which is accessed via electrically operated gates adjacent to the side of the house. Immediately to the rear of the house is a striking split level York stone terrace which can be accessed via French doors from the rear and it abuts the manicured lawns which makes it ideal for large scale family entertaining. Adjacent to this is a beautiful mellow red brick wall which provides complete privacy which is followed by a gently flowing winding stream set upon a slate bed. The large expanses of manicured lawn are segregated by purpose built play areas and a variety of native trees to include a magnificent Beech which provides shade. Further tree specimens include Horse Chestnut, Birch, Ewe and Sycamore. There are wide gravel paths which access all areas of the garden and beyond the play area is a stunning rose arbour which is flanked by meticulously maintained herbaceous borders which have a wide variety of plants and shrubs. Beyond here is an apple orchard and a winding gravel path with neatly clipped and shaped laurel hedging. A further laurel screen provides access to garden storage areas and buildings. Astles benefits from an absolutely outstanding range of buildings which include a detached coach house, barn and former stable block. These buildings provide extensive space which could be used for a variety of purposes and has its own central heating system and there is a large workshop/garage. Furthermore it would make a perfect party barn as it has a fully equipped kitchen with granite work tops, Range cooker along and a Belfast sink. 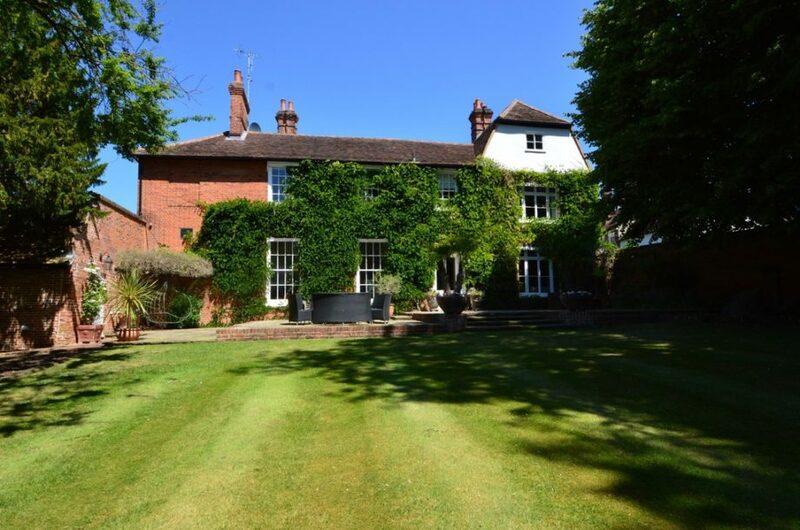 The first floor is accessed via a beautiful solid oak staircase which gives way to further study/office rooms which have oak flooring throughout, two cloak rooms, and a delightful vaulted ceiling with glazed apex which give stunning views to the garden. A spiral staircase then gives further access to storage. There is dedicated vegetable garden with adjoining green house and soft fruit cage adjacent to which is a purpose built lawn mower/garage store. Astles is a simply outstanding village property and I believe it to be the best within this sought after North Essex village as it combines huge versatility within stunning landscaped and meticulously maintained grounds all within walking distance of the village amenities.